These 24-diode LED taillights easily install using a rubber grommet—they simply push into place. This is a 4" round light (requires a 4-1/2" hole) with red lens. Flush-mount LED taillights stay out of the way of rocks and trees on the trail, last longer and shine brighter than OEM incandescent lamps. Available with red or clear lens (make your selection in the "options")—units with clear lenses use red diodes, so they still flash red when lit up. These install right into Poison Spyder Customs Crusher Corners™ or Trail Corners (on units specifically ordered for LED taillights), or can be installed into other manufacturer's corner protectors or anywhere you can cut a 4-1/2" round hole in a flat panel. 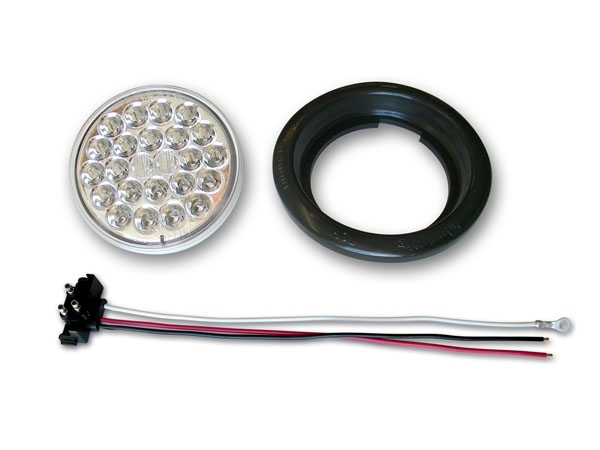 Includes the LED lamp assembly, rubber grommet and wiring pigtail harness. Sold each (order 2 if you need a pair). We've heard that some folks were having trouble installing these, so we shot a quick video with some tips. The trick is to soften the rubber grommet up in some warm water before installing. Check out the video for Alex's install tips!